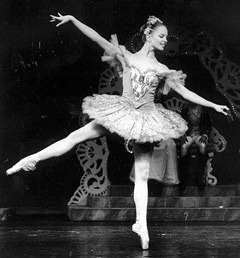 Laura Conley’s Westside Ballet roles included Mirliton, solo Spanish and Dew Drop Fairy in The Nutcracker (1992-93). After training with Westside Ballet, she went on to dance professionally for Hartford Ballet. Laura then enrolled in medical school at the University of California San Diego. “I could never have gotten through the rigorous demands of being a medical student had it not been for the dedication and confidence Westside Ballet taught me,” she told us in March 2002.